Prereq: approval of CAS Honors Committee. 4 cr each, 1st & 2nd sem. Prereq: CAS PY 355 or consent of instructor. Vector analysis; Gauss’s law; electric field intensity; energy and potential; conductors, dielectrics, and capacitance; Poisson’s and Laplace’s equations; steady magnetic fields. 4 cr, 1st sem. Prereq: CAS PY 405. Maxwell’s equations; electro-magnetic waves in vacuum and matter; reflection and refraction; diffraction and interference; coherence; special theory of relativity. 4 cr, 2nd sem. Prereq: CAS PY 355 or consent of instructor. Dynamics of particles and rigid bodies. Newtonian mechanics. Oscillatory motion and motion under a central force. Lagrangian and Hamiltonian dynamics. Coupled oscillations, normal modes, and continuum mechanics. Longitudinal and transverse mechanical waves. Lectures, discussions, and laboratory. 4 cr, 1st sem. Prereq: CAS PY 351 (or 313) and PY 355, or consent of instructor. The laws of themodynamics, statistical basis of thermodynamics, ensemble theory, equilibrium statistical mechanics and its application to physical systems of interest, irreversibility, transport, and the approach to equilibrium. 4 cr, 2nd sem. Prereq: CAS PY 351 (or 313); or consent of instructor. Undergraduate-level introduction to computer programming and methods used to formulate and solve physics problems on the computer. Also touches on more advanced topics such as parallel computing and graphical visualization. 4 cr, 2nd sem. Prereq (451): CAS PY 351 (or 313) and CAS PY 355, or consent of instructor; prereq (452): CAS PY 451. Uncertainty principle; Schrödinger wave equation and applications; operators; hermitian operators and unitary transformations; harmonic oscillator; angular momentum and spin; time dependence; magnetic resonance; parity and identity; helium atom and hydrogen molecule; exclusion principle; Fermi-Dirac statistics; Zeeman Effect. 4 cr each: CAS PY 451, 2nd sem; CAS PY 452, 1st sem. Intended primarily for upper-level physics students but open to others with the consent of the instructor. 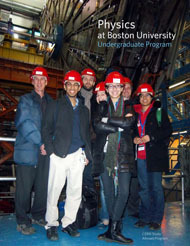 The seminar examines an area of current physics research in depth at an undergraduate level. The seminar topic varies from semester to semester, covering topics such as general relativity, particle physics, biophysics, superconductivity, or other areas of contemporary interest. (CAS PY 482 may be taken multiple times for credit.) 2 cr, either sem. Prereq: consent of instructor and approval of advising office. Intensive study of one aspect of physics under the supervision of a faculty member. Variable cr, 1st & 2nd sem.